Kenneth E. Mapp (born November 2, 1955) is an American politician. He was the 29th Governor of the United States Virgin Islands from 2015 to 2019. He is a registered Republican, but ran as an independent. 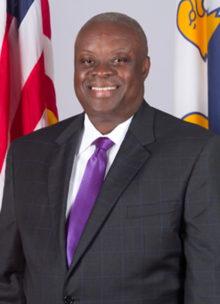 A former three term Virgin Islands Senator, Mapp served as the Lieutenant Governor of the United States Virgin Islands from 1995 until 1999. Mapp was an independent candidate for Governor of the U.S. Virgin Islands in the 2010 gubernatorial election, but was defeated by John de Jongh. He ran in the 2014 gubernatorial election for Governor of the United States Virgin Islands, defeating Donna Christian-Christensen, the longtime Delegate to Congress in a run-off. ↑ Lewin, Aldeth (2010-08-21). "Mapp formally announces his gubernatorial bid". Virgin Islands Daily News. Archived from the original on 2010-08-25. Retrieved 2010-08-25. ↑ Pancham, Ananta (2010-10-02). "DeJongh-Francis to Return for Second Term". St. Thomas Source. Retrieved 2010-11-07. This page was last changed on 7 January 2019, at 22:53.